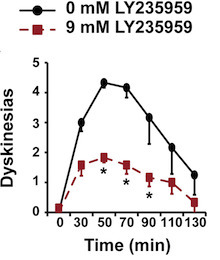 An NMDA receptor antagonist can reduce the rate of dyskinesias in a non-human primate model of Parkinson's. From Singh et al, Cell Reports (2018) -- open access/Creative Commons. Standard drug treatment for Parkinson's disease can over time induce motor complications that reduce the effectiveness of restoring mobility. These complications include abnormal involuntary movements known as dyskinesias. In a nonhuman primate model of Parkinson's, scientists at Yerkes National Primate Research Center, Emory University, have been probing the origin of these abnormal responses to treatment, particularly dyskinesias, and have successfully tested a tactic for controlling them. The results, which will be important for developing new treatment options, are published in Cell Reports. Neuroscientists think dyskinesias come from fluctuations in dopamine, the neuronal messenger whose production is lost in the brains of people who have Parkinson's disease. The standard drug levodopa restores dopamine, but sometimes, in the process of achieving symptom relief, dopamine levels become too high, and responses are unstable. Researchers led by Stella Papa, MD, showed striatal projection neurons (SPN), which become hyperactive when nearby dopamine-producing neurons degenerate, could be controlled by certain drugs, reducing the rate of unstable responses to dopamine that cause dyskinesias. The striatum is part of the basal ganglia, the region of the brain most visibly impacted by Parkinson's. "Our focus was to prove SPN hyperactivity plays an important role and that glutamate signals are a major contributor," says Papa, associate professor of neurology at Emory University School of Medicine and a Yerkes researcher. "Knowing this mechanism may serve to develop different therapeutic strategies: pharmacological treatments or gene therapies." The first author of the paper is former Yerkes researcher Arun Singh, PhD, now at University of Iowa. Laboratories in Emory's Department of Pharmacology made significant contributions to this work, especially the group Stephen Traynelis, PhD, leads; Dr. Traynelis had a key role in the study. Annalisa Scimemi at SUNY Albany also contributed to the study. The researchers tested whether the drug LY235959 (an NMDA receptor antagonist) or NBQX (an AMPA receptor antagonist) could control SPN hyperactivity and dyskinesia symptoms in Parkinson's model monkeys. The nonhuman primate model of Parkinson's uses the neurotoxin MPTP, which destroys dopamine-producing neurons. Both drugs interfere with signals by the neurotransmitter glutamate. In the presence of levodopa, the drugs had calming effects both in single cell SPN recordings and when the drugs were infused into monkeys' basal ganglia. After lowering the SPN firing frequency by 50 percent, the response to dopamine stabilizes and abnormal movements are markedly diminished, Papa says. She notes the particular drugs used are not ideal for use in humans, but they do reveal mechanisms behind dyskinesias, insights that will be valuable to advance the research and develop new treatments with improved effectiveness for people who have Parkinson's disease. The research was supported by the National Science Foundation (IOS1655365), the National Institute for Neurological Disorders and Stroke (NS045962, NS073994, NS036654, NS065371) and the NIH Director's Office of Research Infrastructure Programs (P51 OD011132: primate centers).